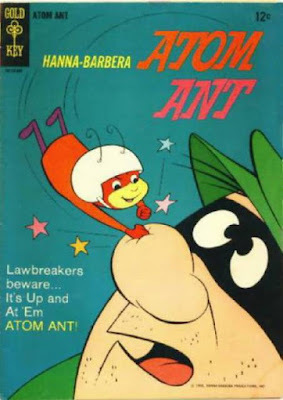 With the popularity of superheroes back on the rise in the 1960s thanks to Marvel and DC Comics, Hanna-Barbera Productions decided to take their own stab at the genre with a straightforward, yet comedic, superhero of their own: Atom Ant. 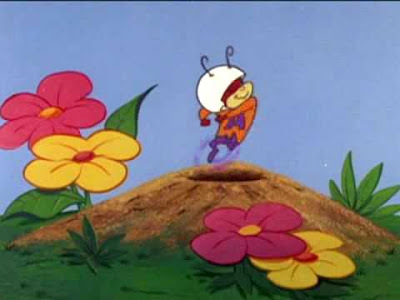 Atom Ant at his Ant Hill. 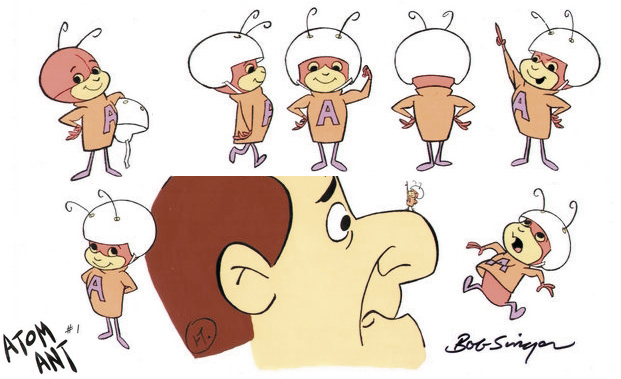 The character and his world debuted in Hanna-Barbera’s first production for NBC: the prime-time special The World of Atom Ant and Secret Squirrel on September 12, 1965. The following month, the special was spun-off into a show called The Atom Ant/Secret Squirrel Show. The show was an hour long, broken up into two parts of three segments each. The first half featured Atom Ant with Precious Pupp and The Hillbilly Bears. Precious Pupp featured the titular character, a mangy dog (Messick, utilizing vocal effects made famous by his later character Muttley), who lived with his owner, Granny Sweet (Janet Waldo). Precious was anything but, often being a terror around his neighborhood both to those who deserved it (like crooks) and just for the fun of it (like against the postman). A particular favorite was sneaking behind an unsuspecting target and scaring the heck out of them with a series of barks. However, he was always sure to act innocently around Granny. Granny, meanwhile, wasn’t your typical grandma. While she did the things you’d expect like knitting, she would also be off entering in various races and sporting competitions, and her main mode of transportation was a motorcycle. 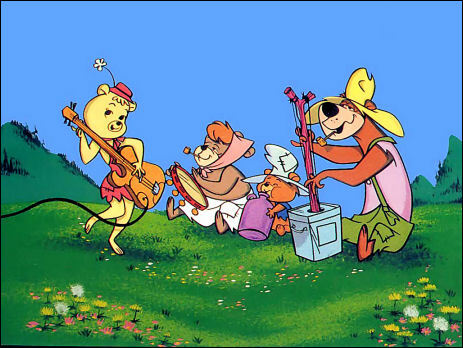 The Hillbilly Bears was inspired by the rise of rural programming on television, such as The Andy Griffith Show or The Beverly Hillbillies. The segment focused on the Rugg family, who embodied all the stereotypes of the hillbilly by lazing about in their shack, brandishing a gun for almost anything, and even engaging in a regular feud with rival family, the Hoppers. Paw Rugg (Henry Corden) was the mumbling patriarch who only managed to utter a few audible words in a sentence (which grew in frequency as the episodes went on to make him more comprehensible). Maw Rugg (Jean Vander Pyl) was his pipe-smoking wife and often times seemed to be the one in charge. Floral Rugg (also Pyl) was their southern belle of a daughter who was arguably the most refined of the bunch. Shag Rugg (Messick) was the youngest child and a certified troublemaker who idolized his Paw. Interestingly enough, Corden and Pyl would also play husband and wife in Hanna-Barbera’s debut franchise, The Flintstones, after Corden assumed the role of Fred Flintstone in 1977 following the death of Alan Reed. 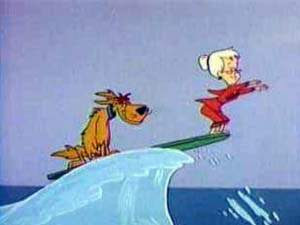 Granny Sweet and Precious Pupp surfing. In 1966, Atom Ant and Secret Squirrel were split into their own separate half hours. Both ran a total of two seasons and 26 episodes before reuniting in 1967 for an additional season of reruns. 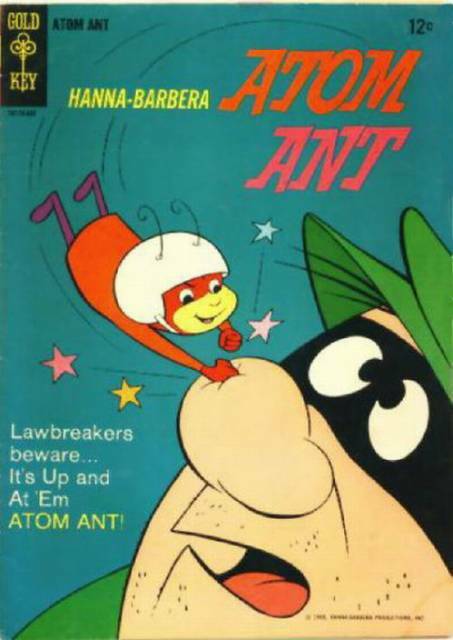 After 1968, Atom Ant was shown in syndication or during episodes of The Banana Splits Adventure Hour. During the show’s run, Hanna-Barbera Records released a record for all three segments: Muscle Magic, Hot Rod Granny and Hillbilly Shindig. Each featured an audio adventure and several songs. The characters also appeared on the slip covers to Golden Cartoons in Song volumes 2, 3 and 4, and the Pupp characters were also featured on the children’s song records Brahms Lullaby and The Lord’s Prayer. The Ruggs playing their hillbilly instruments. Of the three segments, Atom Ant received the most merchandising attention. 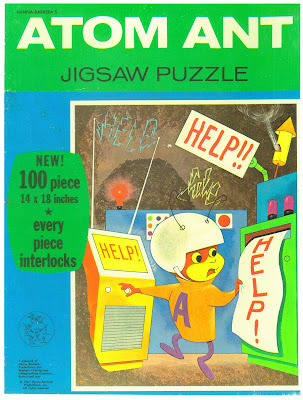 He was featured as a bubble club by Purex, a tricky trapeze and a push puppet by Kohner, on a King Seeley lunchbox, a jigsaw puzzle by Western Printing, a Whitman punch-out playset and coloring book, a Transogram board game, and in a View-Master slide set with Secret Squirrel. 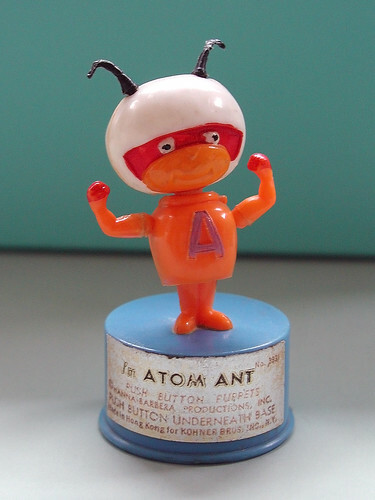 In 1999, Atom Ant was made into a plush doll by the Warner Bros. Studio Store and again in 2000 as part of the series of Hanna-Barbera plush dolls featured as a Dairy Queen premium. 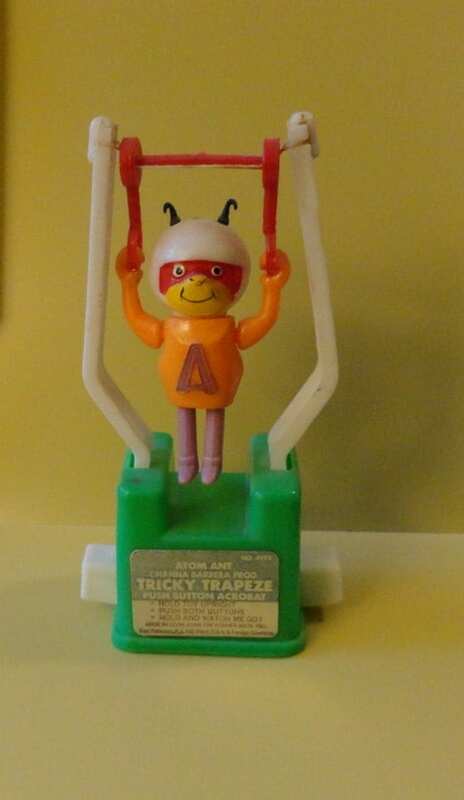 He was also part of a Spanish series of connecting toys playing instruments. Funko produced Atom Ant for their Wacky Wobblers, Big Headz Bobble Heads and Funko Force lines. Nodnik featured Atom Ant in a two-pack with Huckleberry Hound and Big Head Company released a collectible figurine. 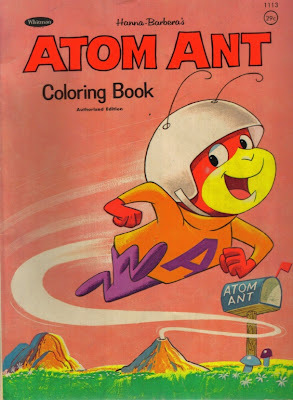 Atom Ant received a single comic book issue published by Gold Key in 1965, which also featured a Bears and Pupp story. In 1995, he was featured in the first issue of Archie Comics’ Hanna-Barbera Presents and in 1999 in DC Comics’ Cartoon Network Presents #20. 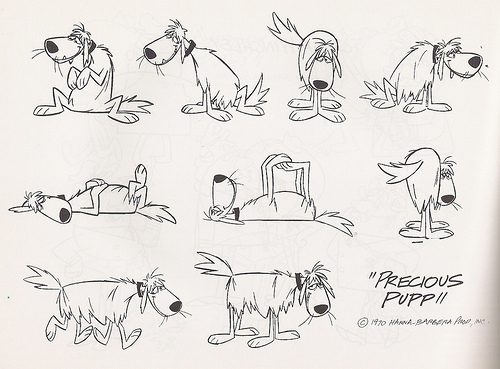 In 1966, Pupp was featured in the December 3rd Yogi Bear newspaper strip. In 1982, Guild Home Video released a collection of the series’ episodes on VHS and Betamax in the United Kingdom. 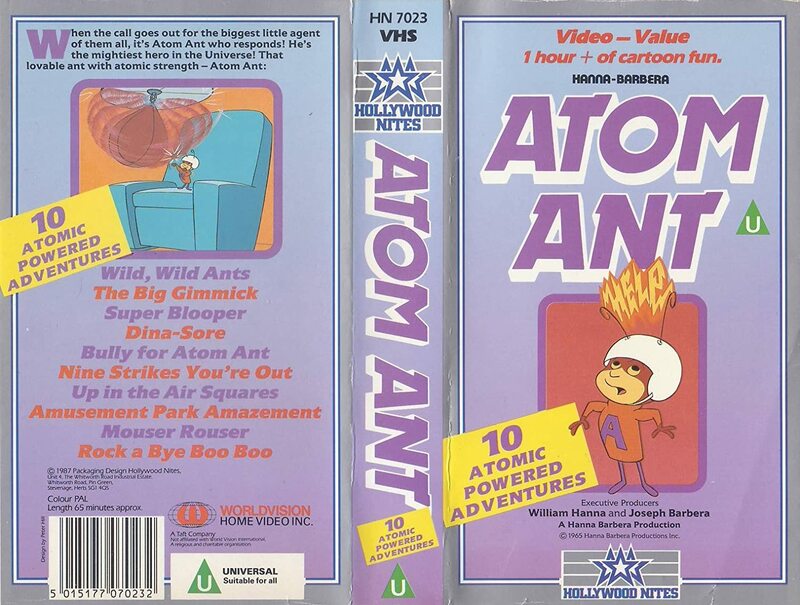 In 1987, 10 Atom Ant segments were released by Worldvision Home Video Inc. as part of their Hollywood Nites line. He later received a 1991 release as part of the Hanna-Barbera Golden Collection. 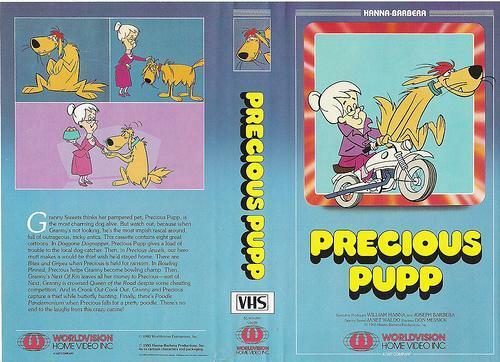 Worldvision also released a collection of Pupp segments and six segments of the Bears on a VHS called “Do the Bear” as part of their Kids Kollection. 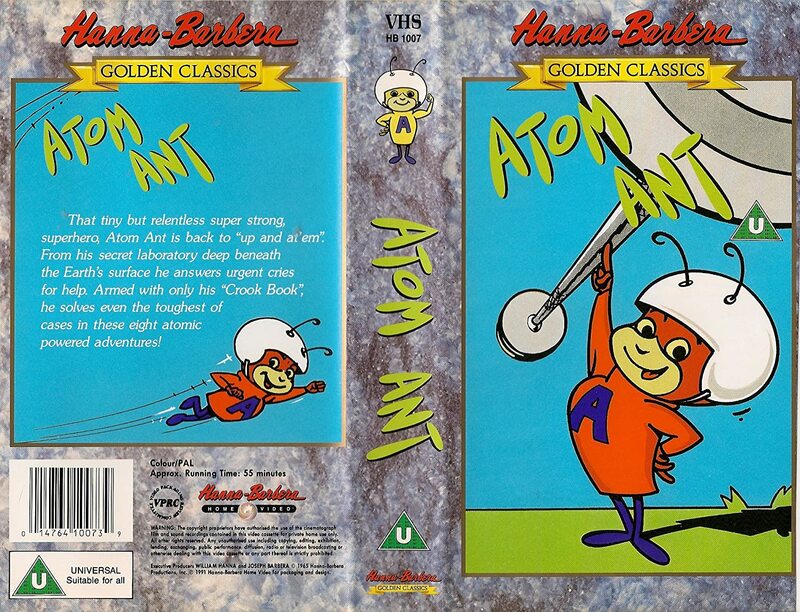 In 2009, the segments “Up and Atom,” “Precious Jewels” and “Woodpecked” were released on DVD in Saturday Morning Cartoons: 1960s Volume 1 and “Atom Ant Meets Karate Ant,” “Bowling Pinned” and “Picnic Panicked” on Volume 2. “The Big Gimmick” and “Do the Bear” were featured in Best of Warner Bros. 25 Cartoon Collection: Hanna-Barbera by Warner Home Video in 2013. “Up and Atom / Precious Jewels / Detour For Sure” (10/2/65) – Atom Ant is sent to recapture escaped convict Big Fats Dynamo. / Pupp protects Granny’s jewelry from a thief. / The Ruggs fight to keep their house from a highway development. “Crankenshaft’s Monster / Doggon Dognapper / Woodpecked” (10/9/65) – Doctor Crankenshaft creates a glob that grows as it eats. / Pupp tries to evade a dogcatcher. / The Ruggs are annoyed by a woodpecker. “Gem-A-Go-Go / Bites and Gripes /Anglers Aweigh” (10/16/65) – Atom Ant has to recover a jewel from Fancy Finger Finnegan. / Pupp is dognapped. / Paw’s fishing for dinner ends up becoming a hassle because of Ol’ Whiskers. “Ferocious Flea / Queen of the Road / Stranger Than Friction” (10/23/65) – A director uses a Ferocious Flea to rob banks. / Granny and Pupp compete in a car race. / Floral and Shag want to start a business and Charlie McGee sells them his for everything they’ve got. “Rambling Robot / Crook Out Cook Out / Goldilocks and the Four Bears” (10/30/65) – Junior’s robot goes out of control. / Butterfly hunting leads near-sighted Granny to catch a “baby.” / A movie star happens across the Ruggs’ house and helps herself to the accommodations while they’re out. “Nobody’s Fool / Next of Kin / Going, Going, Gone Gopher” (11/6/65) – Anastasia Antnic distracts Atom Ant to allow her partners to commit their robbery. / Granny names Pupp as her beneficiary. / Paw has to defend the garden from a gopher. “Atom Ant Meets Karate Ant / Bowling Pinned / Courtin’ Disaster” (11/13/65) – Criminals send martial artist ant Mr. Muto to take care of Atom Ant. / Pupp helps Granny in a bowling tournament. / The Ruggs and Hoppers call a truce so Floral and Claude can date. “Fastest Ant in the West / Poodle Pandemonium /Picnic Panicked ” (11/20/65) – A sheriff asks Atom Ant to deal with a varmint in his town. / Pupp and a bulldog compete for the affections of the new poodle in town. / Claude wants Floral’s picnic basket. “Mistaken Identity / Dog Tracks / Judo Kudos” (11/27/65) – Ferocious Flea frames Atom Ant for his robberies. / Pupp gets a new dog license. / A lost circus bear teaches Paw karate in order to fight his rival. “How Now Bow Wow / Sub-Marooned / Just Plane Around” (12/4/65) – Ferocious Flea uses Bone Brains to steal an award-winning dog. / A Russian sub decides Granny’s surf board is a secret weapon after watching her moves on it. / Paw ends up being hijacked with a stolen experimental plane. “Dragon Master / Lady Bugged / War Games” (12/11/65) – Atom Ant is sent back to Arthurian Times and has to rescue a kingdom from a dragon. / A criminal decides to steal Granny’s $50,000 sweepstakes winnings. / The Ruggs’ home becomes the site of a war game. “The Big Gimmick / Test in the West / Bricker Brats” (12/18/65) – Dr. Von Gimmick battles Atom Ant in his giant robot. / Granny and Pupp visit a Western town where Chief Fliptop is on the warpath. / The youngest in the clans threaten to restart the feud over whose father is the toughest. “Super Blooper / Bones and Groans / Slap Happy Grandpappy” (12/25/65) – Atom Ant helps an actor become a real super hero. / Brutus wants Pupp’s big bone. / Grandpa Rugg comes for a visit and, unaware the feud is over, wants to shoot some Hoppers. “Wild, Wild Ants / Butterfly Nut / Pooped Pops” (1/1/66) – Atom Ant prevents the Anthill Mob from committing a picnic raid. / Pupp has to protect money they found from the crooks who want it back. / No rest for a tired Paw as he’s forced to play Robin Hood with Shag. “Dina-Sore / Precious’ Bone / Leaky Creek” (1/15/66) – A bolt of lightning brings a dinosaur from the museum to life. / Brutus steals Pupp’s bone after he picks it up from the butcher. / Paw discovers the creek ran dry after a beaver built a dam. “Amusement Park Amazement / The Bird Watcher / My Fair Hillbilly” (1/15/66) – Atom Ant gets Dr. Von Gimmick to build his intended amusement park. / Granny babysits a bird that Pupp has to protect from a cat. / Maw sends Paw to charm school to become refined. “Bully for Atom Ant / Dog Trained / Rickety-Rockety-Raccoon” (1/22/66) – Atom Ant helps a bullfighter wind the hand of his love. / Granny and Pupp take a camping trip. / Rcikety Racoon steals eggs from the hen house. “Termighty Mean / Oliver Twisted / Modern Inconvenience” (1/29/66) – Dr. Von Gimmick has Atom Ant go after his super termite. / Granny and Pupp go on an England vacation. / The Ruggs win a sweepstakes and are given every modern convenience for a month. “Nine Strikes You’re Out / Pup, Skip and Jump / Rabbit Rumble” (2/5/66) – A mad scientist makes eight clones of himself. / A puppy comes to the house on a cold wintery night. / Paw and Shag hunt rabbits for dinner. “Go West Young Ant / A Grapple for the Teacher / Speckled Heckler” (2/12/66) – Atom Ant joins in a war against rival ant colonies. / To avoid a lawsuit Granny enrolls Pupp in obedience school. / A scientist offers the Ruggs $1,000 if they capture a rare butterfly for him. “Knight Fight / Pot-Time Work / Whirly Bear” (9/10/66) – Atom Ant heads to the middle ages to save a kingdom from an evil black knight. / While on vacation, Granny and Pupp encounter a cannibal. / The windmill ends up taking Paw on a ride when he tries to fix it. “Pteraducktyl Soup / A Friend In Need / Saucy Saucers” (9/17/66) – A scientist brings a pteraducktyl to life. / Igor wants Pupp’s brain for Frankenstein’s monster. / Aliens abduct Paw. “Up in the Air Squares / Ski Sickness / Chipper Chirper” (9/24/66) – Toadstool steals entire buildings using a magnet attached to a chopper. / Granny enters a ski race. / Paw has to retrieve Maw’s canary while keeping her out of trouble. “Mouse Rouser / Mascot Massacre / Getting’ Paws Goat” (10/1/66) – Atom Ant gets involved in a game of mouse, cat, dog. / Granny wants to get Pupp hired as a mascot for a baseball team. / The neighbor’s goat eats everything in the Ruggs’ garden. “Killer Diller Gorilla / A.M. Mayhem / Buzzin’ Cuzzins” (10/8/66) – A giant gorilla uses the city as a toy. / Pupp has to keep Granny safe when she starts sleepwalking. / Paw mistakes an escaped circus freak for his cousin Fud. “Rock-A-Bye Boo-Boo / Girl Whirl / Do the Bear” (10/15/66) – Atom Ant has to keep a village safe from a Roc. / Granny attends a bicycle race without Pupp. / Playing his guitar in the supermarket leads Paw to land a recording contract. IT'S LAW & DISORDER MONTH!